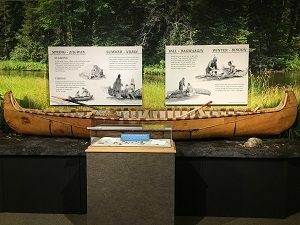 Birch Bark Canoe. Image courtesy of Michigan History Museum. A key component of the exhibit is Trout Unlimited’s founding in 1959 along the banks and how private citizens worked with government bodies to conserve and protect the environment. The exhibition features George Griffith’s 24-foot-long Au Sable river boat, surrounded by river scenes. A re-creation of the Wanigas Rod Shop introduces fly fisherman and rod maker Art Neumann, another founding member of Trout Unlimited. Nearby, visitors of all ages can learn how to tie a fly and compare tied flies to real insects under a microscope. Full details of the exhibit can be found here. The Michigan History Museum is located at 702 W. Kalamazoo St., Lansing, MI and online at www.michigan.gov/museum.